Chances are, now that you’re engaged (congratulations!) you’ll be as loved up as a pair of love birds! Whether you’ve participated in a spot of canoodling with your beloved around your friends and family one time too many or you’re just known to be a happy couple madly in love, you may have gained the endearing nickname term of ‘love birds’, in which case, this is definitely the wedding invitation design for you! 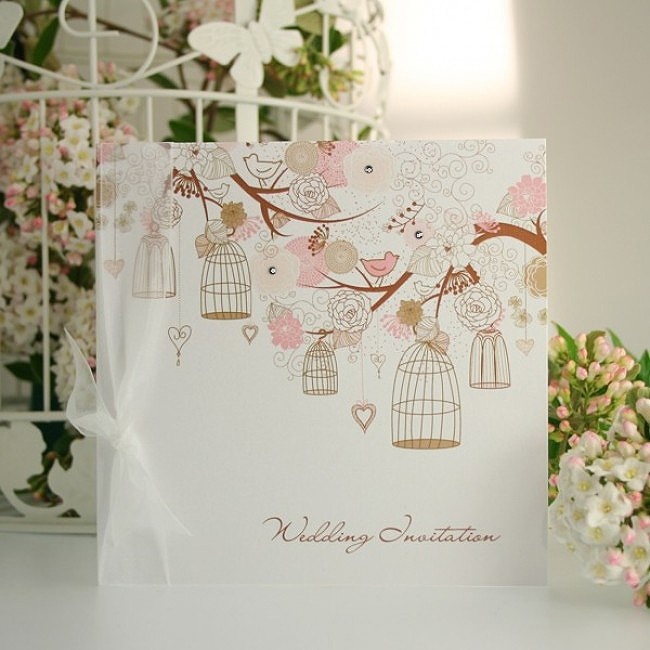 The Love Birds range from Olivia Samuel depicts a lovely little summers-day scene, filled with tiny cheerful birds that tweet from their branches, gorgeous flowers in full bloom, homely bird cages and beautiful hanging hearts. The fact that there are several different flower designs means there is something different to look at every time you scan your eyes across the design. It’s busy in a sweet and interesting way – not at all over-the-top. The hanging hearts serve as a symbol of your love for one another, nestled amongst the growing foliage and singing birds. If you ask us, Love Birds is a real scene of celebration! If that wasn’t sweet enough, the pastel pinks and cream colours have been accentuated with pretty little Swarovski crystals to give that special touch and ‘sparkle’ that is oh-so important on your wedding day. This design has been thoughtfully printed on heavy pearlised shimmer board in order to achieve another dimension and depth that an otherwise ‘flat’ colour wouldn’t achieve. A generous length of organza that has been tied into a bow finishes the look off perfectly. We’re sure that your guests will be singing this design’s praises when they receive their invite in the post! 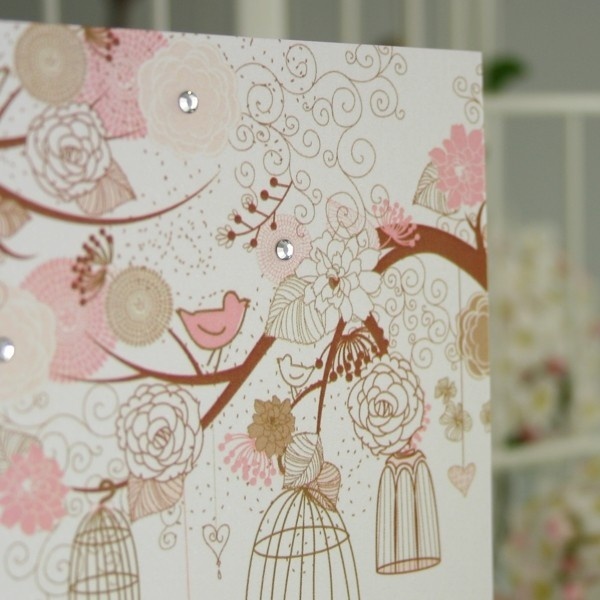 Tags: Birdcage, Crystals, Garden Party, Love Birds, Nature, Pale Pink, Pearlescent.